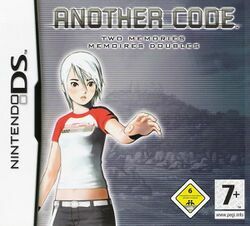 Another Code: Two Memories (アナザーコード ２つの記憶, Anazā Kōdo Futatsu no Kioku? ), released in North America as Trace Memory, is an adventure video game developed by Cing and published by Nintendo for the Nintendo DS portable video game console. A sequel, Another Code: R - A Journey into Lost Memories was released for the Wii. The game's protagonist is Ashley Mizuki Robbins, a 13 year old girl who has been raised by her aunt, Jessica, because her parents vanished when she was three years old. She believed that they were dead, but two days before her fourteenth birthday, she received a package. Inside, was a letter from her father and a small machine. The letter said that he would be waiting on Blood Edward Island, an island located off the coast of Washington in the United States. The next day, the day before her birthday, Jessica and Ashley ride over to Blood Edward Island on a boat, but Ashley's father isn't there to greet them. Jessica goes to look for him, but when she doesn't return, Ashley ventures out to search for both of them. While exploring the island, Ashley also befriends "D", a ghost who has lost his memories. Together they enter the Edward Mansion, each looking for answers to their own questions. This page was last edited on 2 November 2009, at 06:56.